Breadfruit is similar to jackfruit in its appearance and culinary uses. A distinction between the two is the breadfruit’s lack of seeds, whereas jackfruit has several encased in its fleshy pods. Most jackfruits are much larger than breadfruits as well. Jackfruit also bears resemblance to cempedak: jackfruit’s flesh is generally yellow whereas cempedak is dark yellow or orange. 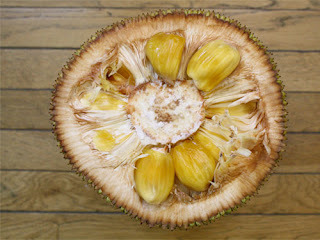 Jackfruit’s skin is also spiky, and cempedak’s has a scaly appearance. Jackfruit is native to India, specifically Maharashtra, Karnataka, and Kerala. Here, its cultivation dates as far back as 3,000 to 6,000 years. KT Achya, author of the book, “Indian Food: A Historical Companion” explains that jackfruit’s first name, “panasa,” arises from a pre-Sanskrit language of Munda. Other ancient fruits mentioned in Munda include jamun and tamarind. Buddhist texts reference the fruit as early as 400 BC, and some Buddhist priests still use the fruit to color their robes. 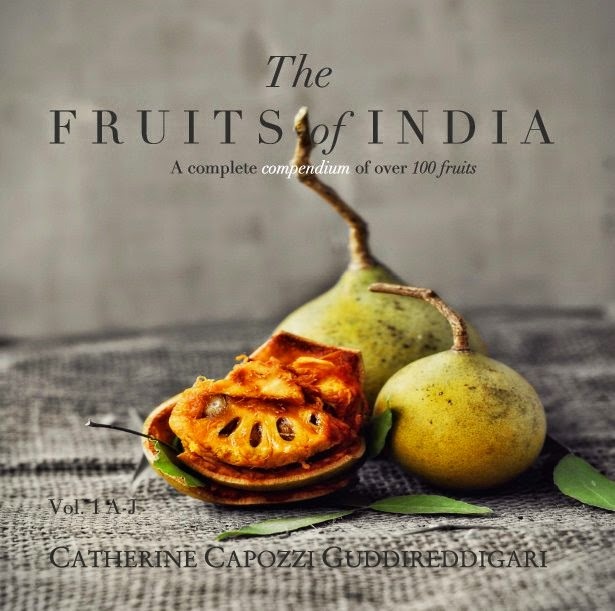 Tamil literature makes note of the fruit in works dating from the 1st and 3rd century AD. In the Perumpaanaru, a wandering minstrel feasted on the “fruits of the jacks.” Another 1st century AD classic, Maduraikanchi, mentions that the fruits were traded in large marketplaces for use in restaurants and hotels. Jackfruit is one of the largest growing fruits in the world as well—a single fruit can weigh up to 100 pounds. Though these stories might have a bit of masala added to them, some people in Kerala claim sightings of 4ft-wide jackfruits. Today, jackfruit has spread to other parts of Southeast Asia: It grows throughout Nepal, Sri Lanka, and Bangladesh. It’s also a popular fruit in Malaysia, Indonesia, Thailand, Vietnam, and several other parts of the world including Africa. Jackfruit grows plentifully in the South and East of India. Regions that cultivate the fruit include the Western Ghats, Deoria, Gorakhpur, Allahabad, Uttar Pradesh, Kerala, Tamil Nadu, Konkan and Karnataka. Faizabad, Uttar Pradesh is well known for its tasty variety of jackfruit. Though India is the second largest producer of jackfruit, an article in “The Hindu” estimates that 75 percent of the ripe fruits goes to waste. In fact, demand for jackfruit products is high, but manufacturers have difficulty procuring machinery and laborers willing to process the fruits. Jackfruit season is September through December, and again from June to August. Peak production is during the monsoon season. The Maharajapuram variety yields fruits even during the off-season from December through July. Jackfruit consumption is much more common in the villages than in urban city centers. This might be because of jackfruit’s status as a poor man’s fruit. However, anyone can find jackfruit when in season. Roadside stands hang the large fruit from their stalls. In high end stores, pre-packaged jackfruit pods sell to those unwilling to go through the laborious efforts of preparing the fruit. The fruit is so beloved in the south that cities have annual jackfruit celebrations showcasing the various products and cultivars. Jackfruit isn’t as common in the north, mostly because of the immense difficulty in transporting the fruit. An August 2009 article by “Civil Society” cites that only 15 percent of farmers in the south are capable of transporting the fruits to distant markets. 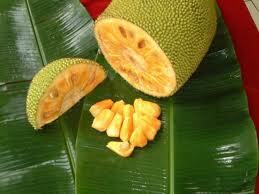 However, northern jackfruit producing states supply the fruits to surrounding cities, albeit in lesser quantities. A few companies purvey freeze-dried jackfruit and fried jackfruit chips as well. Such packaged goods are available year-round, but are not sold in many markets. The Indian jackfruit market is expanding, however, with emerging possibilities of selling jackfruit barfi, dehydrated chips, papads, jam, squash, and juice. The ideal stage of ripeness depends on its end use: If eaten raw, ripe jackfruit is desired. If for savory dishes, unripe jackfruit is preferable. Unripe: the fruit should look yellowish-green, hard to the touch and should be light for its size. The interior of an unripe jackfruit is white and hard. Ripe: a ripe jackfruit is not pretty—the exterior should have brownish-black spots along its golden spiked skin, and an unpleasant aroma of rotting onions to match. The fruit should feel heavy for its size and should yield to the touch. Though the exterior smells like onions, the inside flesh smells like a pack of fruit gum and has hints of strawberry, banana, and pineapple. Ripe jackfruit has a pungent, dense, sweet taste and a savory, filling pulp. Some liken the taste to bananas with a hint of pineapple, but jackfruit possesses a somewhat musky quality not found in either of these fruits. Ripe fruit has an unusual texture that—depending on the ripeness and variety—ranges from slightly rubbery and chewy, to custardy and smooth. Jackfruit is not juicy on account of its low water content. Several groups utilize parts of the jackfruit for traditional remedies. According to the book, “Edible Medicinal and Non-Medicinal Plants,” the ash of leaves is burned with coconut and corn, and then applied to wounds. In India, leaves and root treat skin disorders. The fruit’s latex ameliorates venomous snakebites and glandular swelling. Locals regard the fruit itself as a demulcent, nutritive, and laxative. However, Ayurvedic practitioners warn that overeating causes digestive problems. --According to a study published in the Internet Journal of Alternative Medicine jackfruit illustrated antitumor activity. --The leaves of jackfruit possess hypoglycemic action, as per a 2006 study published in the African Journal of Complementary and Alternative Medicines. --The fruit’s latex has considerable antimicrobial properties, as published in the European Review for Medical and Pharmacological Sciences. --An Industrial Crops and Products study affirmed that the fruit’s wine has high antioxidants. A 2010 article published in Plant Foods for Human Nutrition affirmed its high antioxidant content and polyphenols in the fruit pulp as well. --The Journal of Food Sciences published a study by researchers in Italy showing that jackfruit extracts have significant antioxidant and antibacterial properties against food-borne pathogens. This is the best video on preparing a jackfruit. First, grease the plate, knife and even hands to prevent the fruit’s latex from sticking to surfaces. Cut an incision from the jackfruit’s stem to its tip, and pry open with the fingertips. 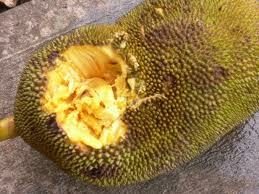 Remove the fleshy, rubbery pods apparent throughout the fruit, especially near the jackfruit’s pineapple-like core. Next, remove the seeds from the pods and set aside. This process is often time-consuming and cumbersome, as there’s much ancillary pulp surrounds the prized, edible flesh. *Tip: if the jackfruit’s sticky latex gets stuck on hands or any surface, rubbing flour on it will help remove the gummy-like sap. Whole jackfruit will keep for three to ten days at room temperature. Do not refrigerate the whole fruit; instead, keep the peeled jackfruit bulbs in a perforated bag in the refrigerator. They will keep for up to a week, but be on the lookout for slimy, graying pulp—this indicates spoilage. Jackfruit pods may be frozen, and in fact, many Asian countries offer them in the freezer section of grocery stores. Note: jackfruit may be substituted in most recipes calling for cempedak or breadfruit, but not durian. --Cook like a vegetable: roast in the oven for 20 minutes at 400 F, or boil for 10 to 15 minutes in salt water. 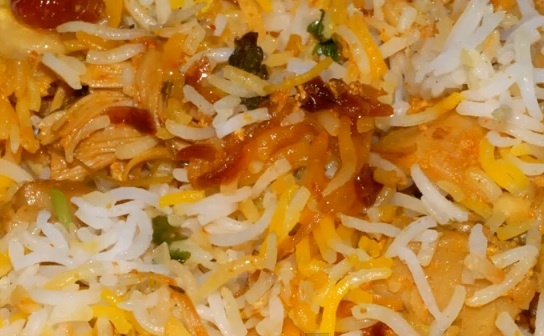 --Add jackfruit to biryani: cut unripe fruit into chunks, throw it in a pressure cooker, add a bit of spice and salt to the mix, and cook until the fruit is semi-firm. Remove, and then add the jackfruit with the other spices, nuts, and coconut cream. --Use the fruit as a vegan substitute for barbeque pulled pork and even chicken. --Stew jackfruit chunks with other vegetables as part of a savory curry. In Uttar Pradesh and Punjab, locals make kathal subzee, a spicy vegetable dish that includes raw jackfruit. --In Mangalore, locals make a dish from raw jackfruit called gujjeda kajipu. Ingredients of this dry spice curry include raw jackfruit, garlic cloves, coconut, onion, mustard seeds, and salt. It’s also common to add shellfish and prawns. --Make jackfruit jam by using a ratio of 1½ cups of sugar for every 1 cup of fruit. Also include lime, cinnamon or substitute jaggery for sugar. 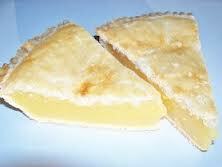 --Create jackfruit custard by adding chopped flesh with coconut milk, vanilla and salt. In Kerala, sweet jackfruit pudding is known as chakka pradaman. Traditional recipes mix ripe jackfruit, jaggery, ghee, coconut milk, and coconut meat. --Make a pie filling of blended bananas, coconut milk, coconut flakes and jackfruit. --Blend jackfruit with frozen bananas, vanilla extract, and coconut milk to make ice cream. Sprinkle with coconut flakes. --Make jackfruit kheer by sautéing fresh slices in coconut oil with brown sugar or jaggery, cashews, raisins, and almonds. Add nut milk or coconut cream as desired. 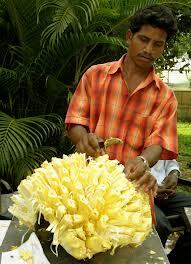 --Mangalore locals also make a sweet jackfruit dish called ghariyo, which is a fritter. To make this local dish, soak rice overnight and then grind with jackfruit and palm sugar until a thick paste forms. Add dry ingredients of grated coconut, salt, cardamom, and rice flour. Mix until pasty dough forms. Deep-fry the fritters in coconut oil, and let sit on a paper towel until cool. Alongside bananas and mangos, jackfruit is considered one of the three auspicious fruits in Tamil Nadu. Hi I would like to know he process for brining jack fruit? I have not been Abe to find this? I found this from the book, "Fermented Fruits and Vegetables: A Global Perspective:"
"Young green jackfruit is pickled in Sri Lanka and India. 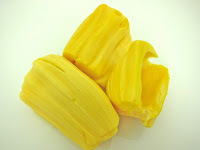 Young green jackfruit are peeled and cut into 1.2-1.8-cm thick slices. The slices are placed in a container and covered in an 8 percent common salt solution. They are weighed down to keep them submerged in the brine. The brine solution is then increased by 2 percent each day until it reaches 15%. The slices are then left for 8-15 days in the brine. Vinegar and spices are added prior to packaging." Thanks for this valuable information about jack fruits. Thanks for the Good Information. It is Telugu but not Telegu.